The couture shows have kicked off in Paris, and already I am drooling over the clothing confections that the world's finest fashion designers have presented. 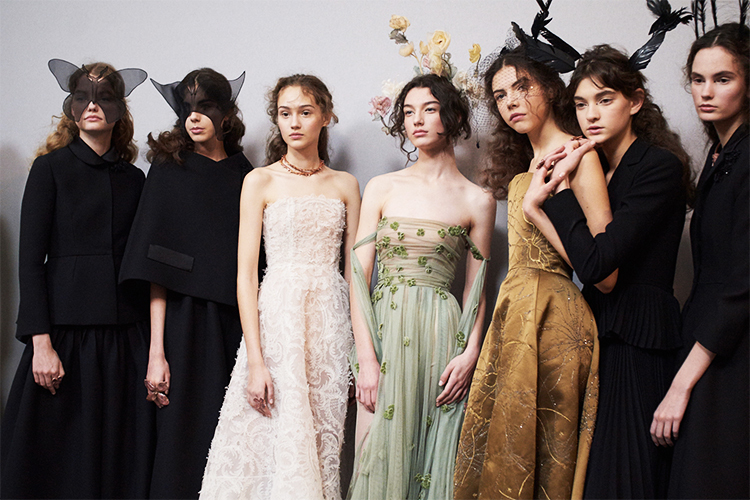 From a pre-Raphaelite fairy tale at Maria Grazia Chiuri's couture debut for Dior to over-the-top trains at Giambattista Valli, the magic and extravagance of couture is in full force. Expect to see many of these looks on the Oscars red carpet, because there are just so many gowns on the runway this season! So far, it's been an old-school couture season in the best way possible, and I'm excited to see what the rest of the week has to offer. 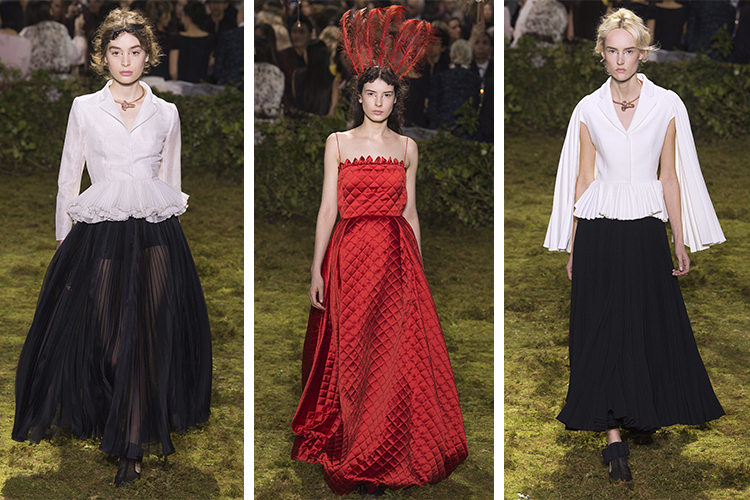 Perhaps the most anticipated show of couture season, this was Maria Grazia Chiuri's couture debut at Dior. 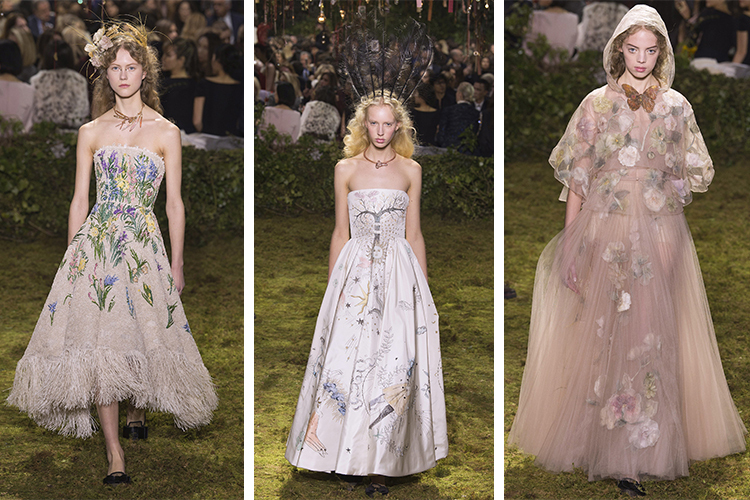 Guests gathered in an otherworldly forest dreamscape as models sauntered about in dreamy, feminine designs. 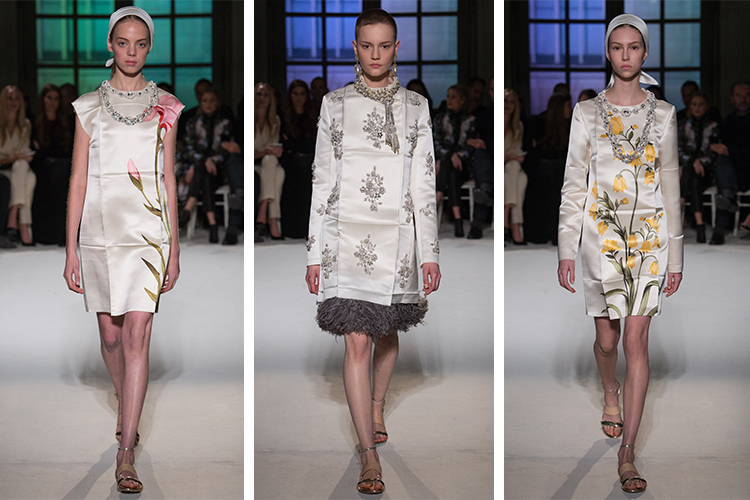 The collection was romantic in both senses of the word, full of gauzy chiffon and delicate floral details. 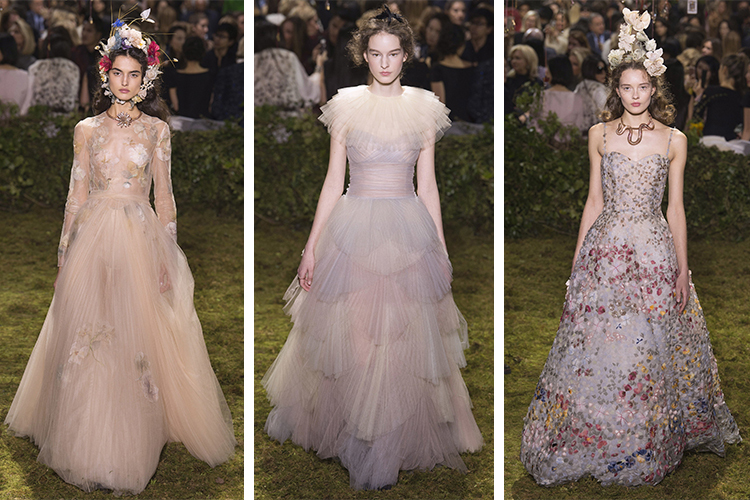 Christian Dior always had a thing with flowers, and I adore how Grazia Chiuri used nature as inspiration here. 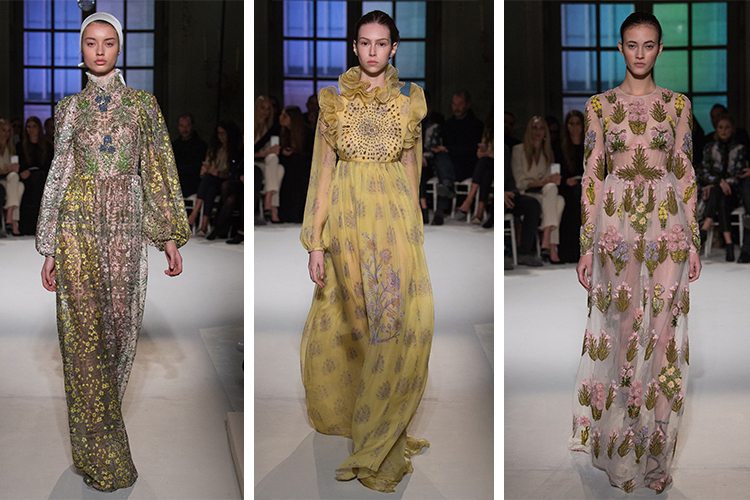 There's a Renaissance quality to these gowns, from the illustrated motifs to the rich quilted fabrics, and one could almost imagine the figures from Botticelli's Primavera leaping off the canvas to get their hands on these clothes. The looks I featured as highlights may not be the go-to gowns amongst celebrities, but there were plenty of red carpet-ready dresses to choose from, and I'm sure we'll be seeing a number of them on February 26 (the night of the Oscars, of course). See the whole collection here. 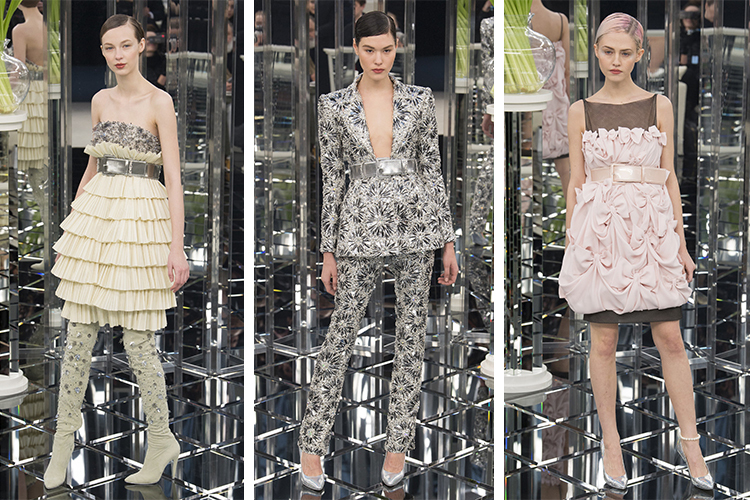 At Chanel, Karl Lagerfeld kept the themes classic and focused on tailoring and workmanship. 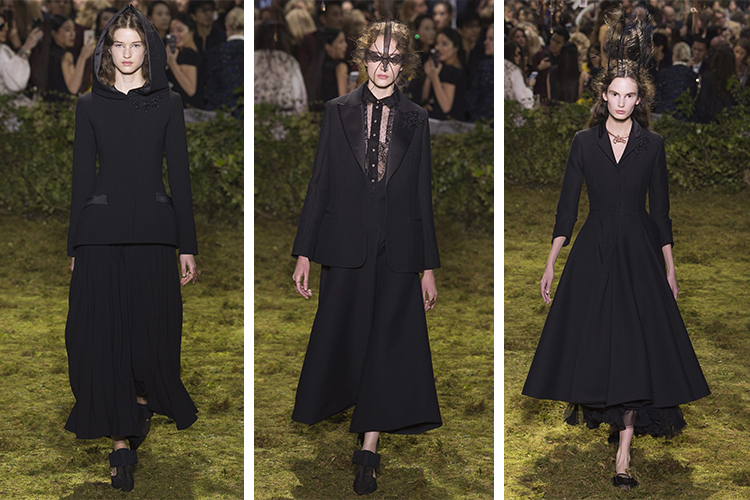 The first half of the collection was full of classic Chanel tweeds and skirt suits, polished to perfection and perfect for the (couture-clothed) working woman. The latter half gave way to party dresses and ball gowns, ripe with feathers, ruffles, and beading. For the final look, It-girl and muse Lily Rose-Depp emerged in a rose pink 100 layer cake of a dress, causing Fashion Barbies like myself to die of envy. I mean, talk about a dress! For me, Chanel is at its best when it leaves kitschy gimmicks behind and focuses instead on timeless, beautiful pieces, which is why this collection was such a treat. 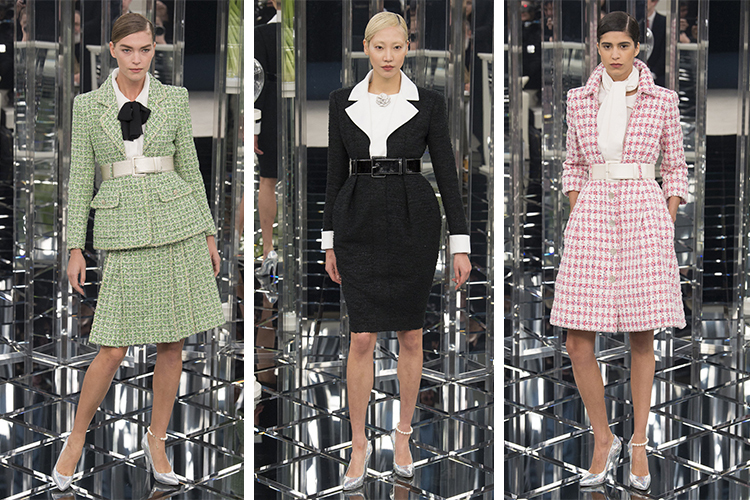 Leave it to Lagerfeld to always find a way to make even the most familiar of Chanel staples to feel new again. I don't know if anyone will be brave enough to rock the finale dress on a red carpet, but I will gladly volunteer as tribute. Another look I would wear to a chic party in a heartbeat is this feather-bottomed mini dress. 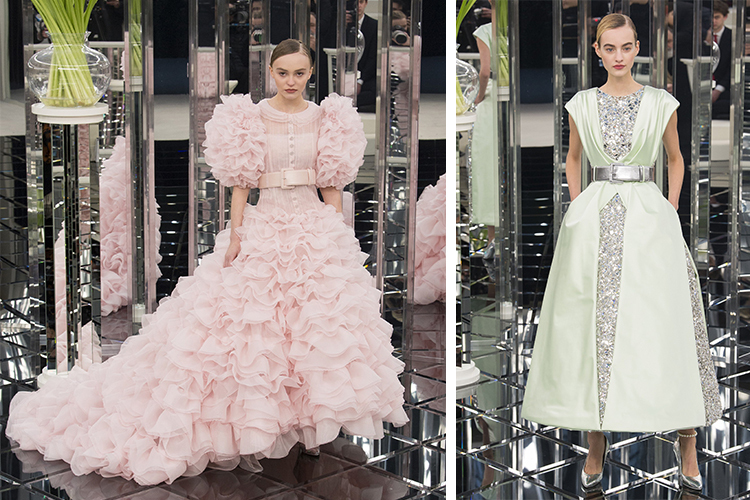 If you're reading this, Chanel PR people, I'd love to rock that dress outside the next couture show! P.S. In "couture trends real people can adapt to their average, non-fabulous lives" news, according to the Chanel show, waist belts are officially in again. Each look was finished off with a waist-defining belt. Will you be raising this mid-2000s trend from the dead too? The voluminous pink dress was also a highlight at Giambattista Valli's show, where hundreds of layers of tulle and obnoxiously long trains are de rigueur. The show started off with restraint, featuring silk day dresses that had been intentionally creased and wrinkled in order to evoke how these dresses would respond to—gasp—everyday wear. Whoever would fold up a couture dress and wear it sans ironing is probably a monster, but whatever, it was part of Valli's vision, one where real life actually impacts clothing (even couture). The day looks gave way to gowns, first balloon-sleeved 60s-style dresses, then tutu-like mini dresses with extended trains (is the mullet dress making a return? 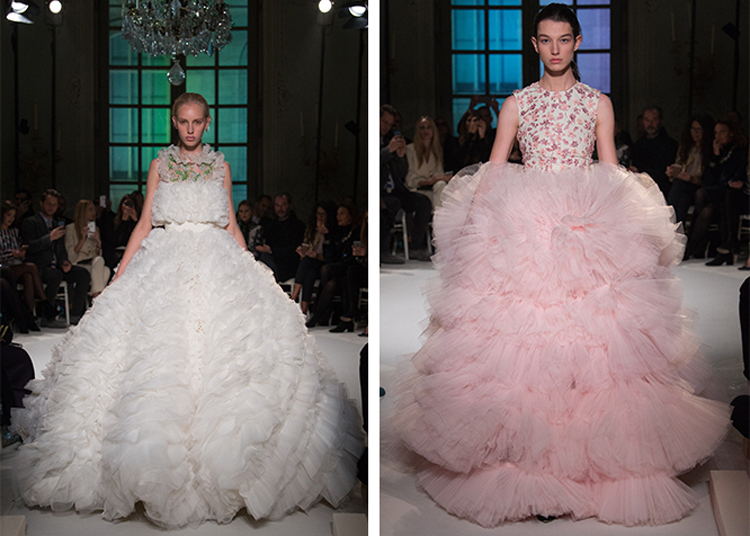 ), and finally the gigantic, tulle-tiered ball gowns that Valli has become famous for. I adore these incredible dresses season after season, but the standout look of this collection was the ruffled pink dress with a billowing, cascading train and fantastic sculptural shoulders. No doubt this dress will make for a stunning editorial look. The show ended with a marigold ball gown reminiscent of Belle's iconic dress in Beauty in the Beast. Here's hoping Emma Watson rocks it for the premiere, because that would be an incredible red carpet moment. Check back on Friday for more thoughts on Spring 2017 Couture! 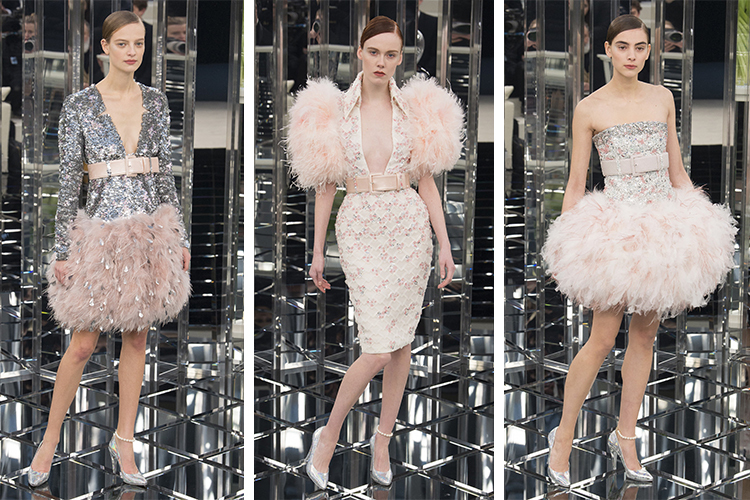 Which couture collection has been your favorite so far?